Bus from Malacca to Butterworth is one of the highly sought-after long-distance route in Melaka Sentral Bus Terminal. Many tourists and locals rely on this bus service because there is no flight and train service between these two cities. Therefore, bus service is the only mode of transport to travel from Malacca to Butterworth. Transnasional, Kejora Express, Intercity Coach and Cepat Express are few bus operators providing bus from Malacca to Butterworth. By having up to 4 daily departures, Transnasional becomes the dominant player serving bus from Malacca to Butterworth. Their combined trips have total up to 9 daily departure from Malacca to Butterworth. The first bus service starts in the morning 8:30am. The last bus leaves the bus terminal at 10:00pm. In between, there are number of bus running from Malacca to Butterworth. The travel time needed from Malacca to Butterworth by bus is about 7 hours depending on the weather and road traffic condition. All operators are operating this route with VIP coach which comes with spacious seat and big leg room. This is to ensure comfortable journey for passengers. Because this is a long-distance journey from Malacca to Butterworth, at least one stopover will be given to passengers to buy some snack from the rest stop or have a short washroom break. The bus fare from Malacca to Butterworth is reasonably charged in a range of RM 45.00 to RM 55.00 depending on your selection of the bus operator. The pick up point in Malacca is at Melaka Sentral Bus Terminal. The drop off in Butterworth is conveniently located at Penang Sentral Bus Terminal. 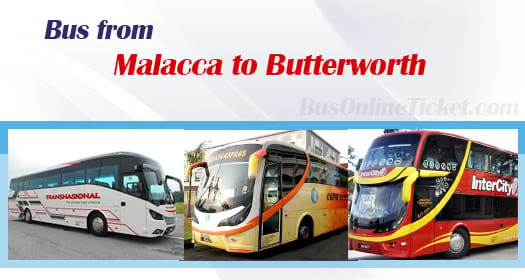 As long as you have an Internet access, you can book for bus ticket from Malacca to Butterworth online with instant confirmation at BusOnlineTicket.com from any corner. With only few simple steps, you can book your ticket online without the hassle of travelling to the counter to purchase a ticket.